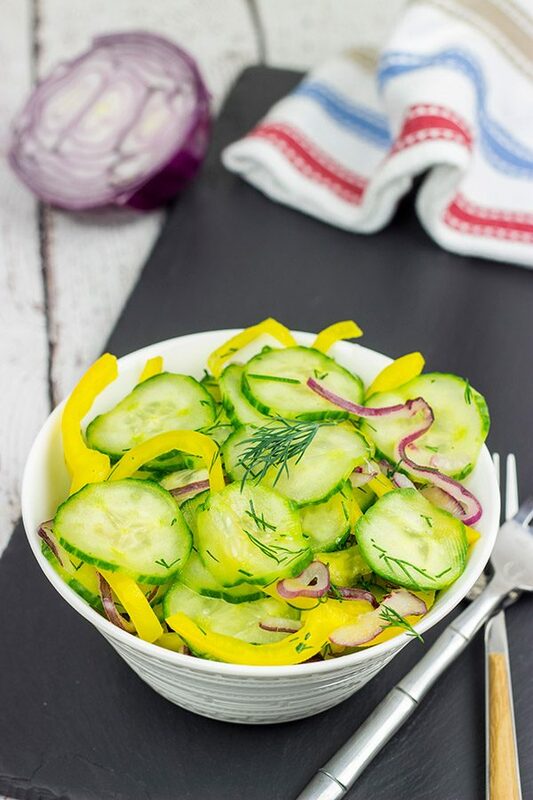 This Cold Cucumber Salad is an easy and healthy side dish that pairs really well with your summer grilling recipes! Growing up, we almost always had a cucumber or two in the fridge…but we hardly ever ate cucumbers. Why is that? Because my Mom loved to make vases out of those cukes. Seriously. My mother has always been super creative, and at some point she discovered that cucumbers actually make great flower vases. I’m not kidding one bit here, folks. A cucumber flower vase is a real thing! If you think about it, cucumbers are mostly water already, right? So the cucumber skin clearly does a good job at holding water. So then it’s not a far logic jump to realize that a cucumber vase would also hold water. My Mom would just slice off a thin piece of the end of the cucumber so that it would stand upright. Then she’d cut the cuke in half and hollow out the middle with a spoon. Boom. Cucumber flower vase. I mean it only holds a single bud, but it works! And such was my life growing up. I made a cucumber flower vase for Laura when we first moved in together, and she told me it was an excellent waste of a cucumber. I mean she’s an engineer. She cuts straight to the chase. While I still think it’s cool that a cucumber can function as a flower vase, I do prefer to actually eat my cucumbers these days. Cucumbers really are one of those overlooked veggies, too. Not anymore! This Cold Cucumber Salad uses cucumbers as the star of the show…no flowers involved! Now cucumbers do hold a lot of water (thus the vase thing), so you do need to let this salad sit for a bit for the water to drain out. The recipe calls for you to salt the sliced cukes as the salt helps draw more water out. 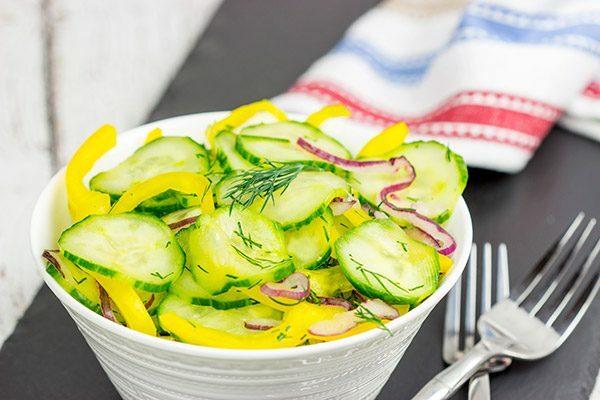 But other than that, this Cold Cucumber Salad recipe is an easy one to keep in your back pocket when you need a healthy side dish to go along with your summer grilling recipes. So next time you’re in the store (or the garden), grab a couple of cucumbers to make this Cold Cucumber Salad. And then grab an extra one to make a cucumber vase. Cheers, friends! Place cucumbers, onion, pepper and salt in a colander; toss until well combined. Let mixture sit and drain for 20 minutes. Rinse vegetables in cold water, then press vegetables firmly but gently with several paper towels to press out as much water as possible. Using a large bowl, combine vegetables with vinegar, sugar and chopped dill; toss until well combined. And I have to say your mom sounds like a very creative lady. I totally understand what you mean about dill. It’s a strong herb for sure. But that’s what’s fun about this recipe…you can just sub in another flavor profile depending on what you like. And, yes, my Mom is creative…silly cucumber vases. Haha! Thanks, Frank! And now you know that cucumbers can indeed be used as a vase. Stick a flower in there and you’ve got kitchen decoration! Hah! This salad is a quick and easy one that we like to whip up for a side dish. Although I could see it being super tasty (and healthy) for lunch, too. Thanks, Kelsie. Stay cool, ok? Hahaha – Laura’s reaction to your replication of that cucumber vase is priceless! Though, I gotta admit – dang, your mom was pretty darn brilliant – I would never have thought to stick flowers in cucumbers – ever! Growing up, we never had cucumbers hanging out uncut in our fridge as my mom would make raita (cucumber yogurt salad of sorts) as soon as she brought cucumbers home. 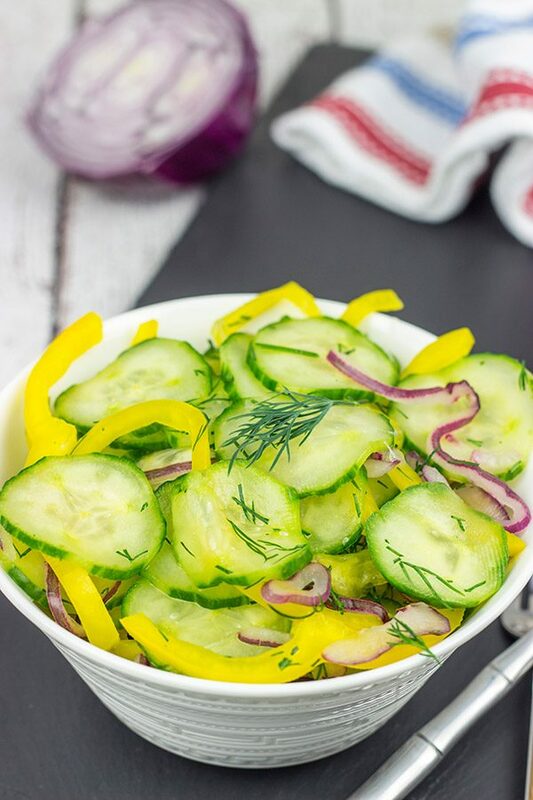 Speaking of cucumber salads – This would be glorious to enjoy with some burgers outside! We have a potluck pool party coming up in a couple of weeks and you have given me a good idea of what to bring! Happy Monday, my friend! Hoping y’all had a wonderful 4th of July week visiting family! Sticking flowers in cucumbers is definitely an odd thing…but it works! I grew up with it, so it didn’t strike me as strange. But Laura? She thought it was downright silly! Ohhh. Raita. Now I’m craving that! Also a potluck pool party? I could go for a pool party! It’s been crazy hot up here in New York lately. This cold cucumber salad is good for hot summer days…I can personally attest to that one. Thanks, Shashi! Your mom is quite creative, but I’m with Laura – Cucumbers are made to be eaten! 🙂 This salad is right up my alley – filled with some of my favorite ingredients. Our cukes are quite ready in our garden yet, but when they are, I’ll be making this salad for sure! So I didn’t think much of the cucumber vases when I was growing up because, well, they were just there. But Laura thought they were silly. Hah! I’m all about using those cucumbers in recipes, though…and this cold cucumber salad is a good one, Kathy! It’s quick, easy and perfect for hot summer days. Thanks so much, my friend! Well, a cucumber vase is a first to me, but it actually sounds very Martha Stewarty. I could see a bunch of them on a large platter of goodies, honestly. It would be pretty! Love the salad. It sounds good chilled. Hah…yes, that cucumber vase does sound very Martha Stewarty. I didn’t mind the vases as they were just ‘normal’ growing up, but I am not a Martha fan at all. Still, it’s a fun idea! And I like the idea of using the cucumber vases to decorate a plate of appetizers. Thanks, Mimi! Hi Davie! You have perfect timing! Our garden, especially cucumbers, is in overdrive right now! I have over fifty (YES fifty) cucumberz sitting in my kitchen right now, from just two plants! This would pair so well with a steak and grilled sweet corn! This afternoon (and probably well into evening) I’ll be making pickles and pickles and pickles! I must say cucumber vases would be perfect for a summer picnic table! Fifty cucumbers!? Holy cow, Dorothy. You’re going to be eating cucumbers from now until next year. Haha! This salad is a tasty (and healthy!) one, so it will help get rid of some of those cukes. But not 50! But pickles you say? Now I’m on board with that one! I love a good pickle…especially on my grilled summer burgers! Thanks so much, my friend, and happy pickling! 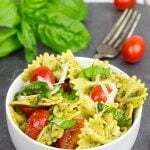 David, I love this recipe! I love cucumbers, and you are so right, this would be a perfect side for a burger on the grill! Yum! And the vase idea, BRILLIANT! Who’d have thunk? 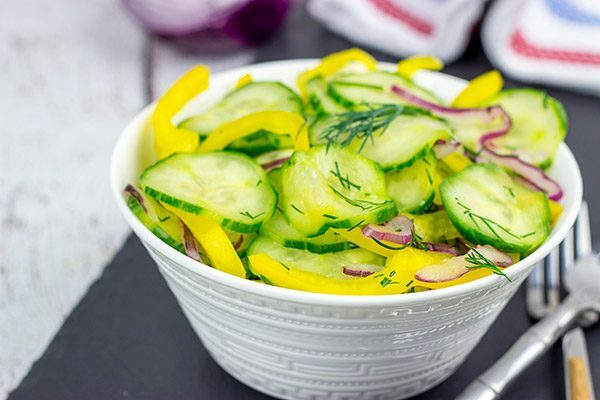 This cucumber salad is a quick and easy (and healthy!) summer side dish. It’s refreshing, and it goes particularly well with grilled foods…like steaks and burgers. Keep it in mind for sure! Thanks so much, Laura! Cucumber vases? That must be one of the most creative ideas I’ve ever heard (And that’s certainly the most creative way to enjoy cucumbers). But I’m glad that you finally have cucumbers in your food too, David! They’re so refreshing and delicious, and we are not even bothered with a high water content and drying them out. 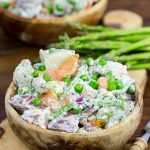 This salad is super easy yet delicious – we often enjoy similar salads even without grilled things. Yup, growing up everything was fair game for crafts…even cucumbers! I’m not a very crafty guy, but I do love to cook so I use the cukes in my recipes instead. 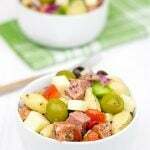 This salad is perfect for hot summer days. And it’s really pretty easy to make, too! Thanks, Ben! I can imagine this would go really well with a summer grilling recipe. And as I’m due to get the BBQ out again this coming weekend for a “World Cup Party” your publishing of this recipe is timely David. I’d never heard of cucumbers being made into flower vases. But now I think about it I can see how that would work with the inside hollowed out and a cucumber being mostly water anyway! What a genius idea. But like you, I thnk I’d rather eat them. 😀 Thanks for this recipe! Oh man, don’t even talk about the World Cup right now, Neil. I’m in mourning after Belgium’s loss yesterday. I’ve been saying for a while that I think France will win it this year, but I was pulling for Belgium. It was a great run, and they were well-matched against France. If that game was played again, it could end in Belgium’s favor. But just not this time. Oh well. I’m assuming you guys are pulling for England? Back to food! 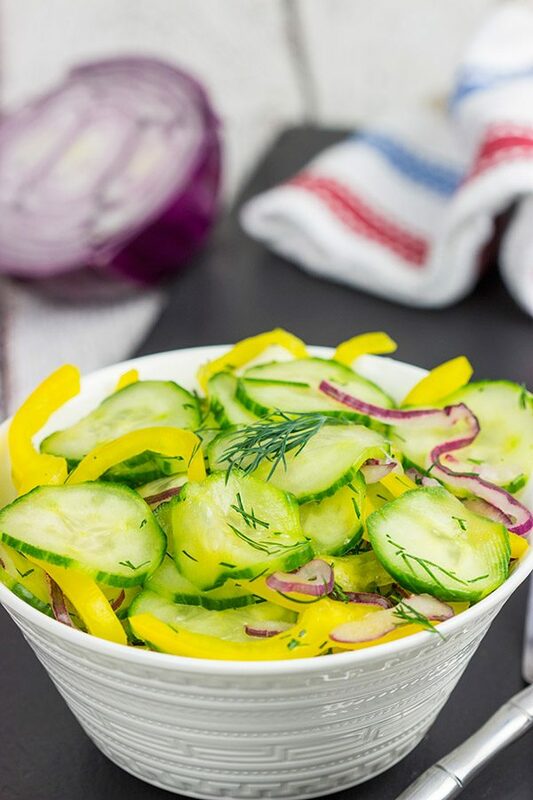 Yes, this cucumber salad is a super easy side dish that goes quite well with grilled recipes. Enjoy, my friend! This is such a beautiful salad. The vibrant colors jumped out at me on FB so I just had to jump over to see the recipe. And good call, it would be perfect with a delicious juicy burger! Hey Valentina! Thank you so much for taking the time to hop over here…I really appreciate it. 🙂 This cucumber salad is so easy (it’s almost silly how easy), and it goes great with all sorts of grilled foods. Cheers, my friend! My husband loves cucumber salad and yours looks great, no peppers for us but I love dill.